So are you ready for a bitcoin fantasy game? While playing BitFantasy the player is expected to live in a persistent world, own property and items. The player is also expected to complete quests and solve mysteries,which help to him fight off the enemies trying to destroy Bitlandia, where he lives. To find these quests the player has to build some new roads. These roads help the player discover new villages, resources or mysteries. The main antagonist in the game is a world eating monster which is destroying Bitlandia. To make bad matters worse, the royal guard has also started a revolt against the queen. The queen then recruits the player to kill the monster, fight the royal guard and rebuild the world. The player is given a lot of responsibilities while in the game. He is expected to do farming, breed animals including pets, craft and farm items, then cook and eat all of them – or sells them. The site has two modes of the game; a fallback mode that works on mobile devices and an HTML5 mode that plays more like a desktop game. This mobile version of the game enables the players not to be hindered by their movement since they can play on their mobile phones while on the move. Since the site is still under construction, there are place holders put so as to hold the layout together.When the game is finished developing and the placeholders removed, I don’t think there will be anything like it. It already looks like a decent piece of work. The customer membership is divided into four groups, each going for different price and also having varying privileges. This gives the customer options to choose from. The player opts for the package that he is comfortable with. This a well thought out idea since not all players are pleased with the uniform membership offered in most casinos. The site provides escrow services to trading parties on the site. This boosts the confidence of the trading partners since they know that money is already assured. The site offers a platform for people to interact with each other as long as they remember each other. It offers a certain special feature that allows the customers to Interact with fellow subscribers even when they aren’t online. The graphics of the site are simple and easy to follow for any player. This is still expected to improve following the completion of the site. All transactions are done on the browser and no plugins, flash, downloads or installations needed. The use of bitcoin as the medium of exchange in the casino is a very noble idea given bitcoin`s convenience during transactions. Bitcoin is one of the cheapest ways to send and receive money over the internet to gamble since there are no transaction fees involved. Also only the recipients address is required to make the transfer. Not only is the site the place to go if one wants to play, but it is also used as a market. In this market any one can buy or sell anything. Even if the players cannot buy from bit fantasy, they can trade amongst themselves and enjoy the escrow services provided for by the site. The site claims not to have any hidden costs or “pay to win” style content. But this does not hinder the players from playing for money which is optional. The registered players can enjoy the games available without having to pay dime. Also, the registered members are free to trade with each other in the site. BitFantasy doesn’t require any additional information about the player during registration. The only things requested are the bitcoin wallet, and the email address. If confessions from players who regularly visit the site is anything to go by, the site seems like the place to be for anybody who considers himself a gamer. The site also provides a platform for people to interact even when they are not online. The site states claims it is not a gambling site and that the game doesn’t have hidden costs. This means that the game is just for enjoying and therefore not a place where people go to risk losing money. We do know however many players do use the site for gambling purposes and is a way to protect the site from government agencies. For a player to remain a member of this site, he or she must renew their membership after expiry. Going by the number of current members who always renew their membership and the amount of new players flocking in day after day,it then lends credence to the sites status as being on the rise. The registration fee asked of a new player might put off many potential customers. Most people don’t believe in paying for something they don’t even know about. The casino should at least have given the players a trial so as to savor and discover the goodness of the game and maybe they would be interested to join the fold. The game can only be played on a modern web browser. This therefore creates a big risk of blocking out players who have outdated and obsolete web browsers e.g mobile phones. The developer should at least perform a cross browser compatibility tests some as to try and accommodate more players into the game. Those players who are used to going to places like these to make money through gaming are disadvantaged. Here the player pays to enjoy his time on the site but not to earn from others and the house. The site assures all its customers that they would enhance security and seal any loopholes that might lead to the privacy of the player being threatened. The site has set up a security system that ensures that the player doesn’t feel insecure in any way whatsoever. There are measures put in place to pull in the stated direction. This includes putting in place a file transfer protocol that encrypts data during relaying. This ensures that there are no third parties are involved in the transactions. The site admits that no system is completely foolproof. Therefore in case of any unexpected breach of security or privacy occurs, the house is ready to launch an investigation into the matter so as to determine where the customer suffered damages. If the player is found to have suffered, the site is ready to pay the customer the said amount. The site has at least recognized the power of always keeping in touch with their customers. 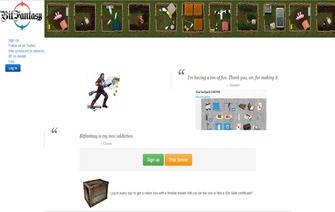 By providing a customer run wiki, the site provides the players with a platform through which the players can help each other depending on their needs. This is important because, customers understand their woes and therefore try to help in a different matter to the one the house would have used. The presence of a twitter account in the name of the site is one bold move. This is due to the fact that, this is where the player and the site administrators might come into direct contact which I don’t think would be a very comfortable thing for the site. More often than not, the house might want to act like a neutral arbiter in any situation that arises while on the site. They also try to prove how fair they are in their transacting with their customers. Unfortunately it is not possible to completely prove the fairness of the site. Therefore the players are advised to exercise caution in any decision they are to undertake while on the site. The player should know that just like other businesses, the site is there to make money. This, the player should not let it be done at his expense. Sothe player should never lower his guard to allow the site take advantage of him. But if by any chance the player is got off guard he should not say that the site acted maliciously. Lastly it is worth noting that even with the above mentioned limitations, the site has been able to maintain a steady increase in the number of customers visiting the site. The administrators of the site themselves admit that the site is not complete. I believe that with completion, the site can only get bigger and better. But if looked into keenly, it seems as if the site`s strengths far outweighs its limitations. If the site administrators heed to and correct the limitations stated above, growth of the number of users is surely going to increase for this site.And not too far in the future they would start playing in the big league.and then the site will be able to compete with the big boys of web marketing. With increased user satisfaction and a growing fan base, the future of the site is something worth keeping an eye on. We have initiated a rating of A for BitFantasy and expect them to earn the A+ rating within a given short amount of time.